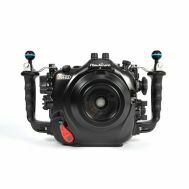 The Nikon D7500 housing further enhances the market leading Nauticam ergonomic experience with improved control placement in a compact, light weight housing produced with cutting edge manufacturing processes. The right grip is mission control for the D7500 camera, accessing many of the frequently used camera functions. 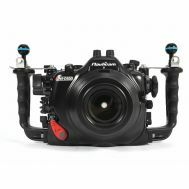 Oversized levers are identifiable by feel, allowing tactile operation while framing with the optical viewfinder. The most frequently accessed fingertip controls (Shutter Release, Main Command Dial, and Sub Command Dial, Video Record, and AE-L/AF-L) are located here. ISO, the primary exposure control used by DSLR video shooters, is accessed by a convenient thumb lever under the right grip. INFO, useful for calling up the camera settings on the 3.2" rear color LCD, is placed at the left thumb. A double thumb lever accesses playback and the INFO Button. 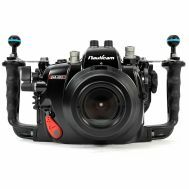 The Nikon D7500 camera in a Nauticam NA-D7500 housing offers two assignable push buttons (AE-L/AF-L, and FN1) that can all be accessed from the housing handles. 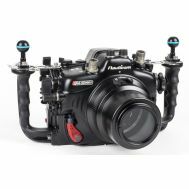 Circuitry included as standard equipment provides constant monitoring of water tight integrity when combined with an optional Nauticam M16 Vacuum Valve II (PN 25625). A simple vacuum reset push button placed in the port mount allows the vacuum system to be reset from the housing front. Ideal for quick lens swaps! 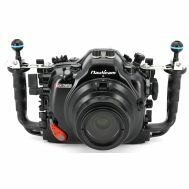 The D7500 camera's pop-up flash fires inside of the NA-D7500 housing, and optical TTL compatible strobes connected by fiber optic cables allow manual and TTL flash exposure. 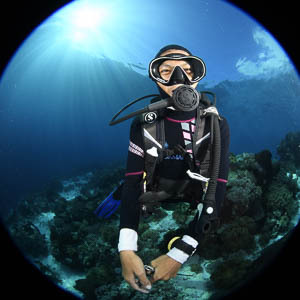 There are no connections to flood, or fragile wires to break, and nearly every popular underwater strobe supports optical triggering. The optional Flash Trigger for Nikon, PN 26304 can fire at the full 8 fps of the camera, making it the ideal solution for the rapid fire fast action shooting and improved battery life that the D7500 now allows for.